Google, please zoom in on us. Since when was Toys R Us satanic? Deacon Jones whips up another... Masterpiece? Crusty, unique and downright... disgusting? The crime is in the time. Palin's son goes to Lee? Oh boy, a blog post about towels. Construction of the centerpiece begins! Churches are corrupting the English language too? Hmm... I wonder which pump I'll use? 14 wongs don't make a right. You messed up, Deacon Jones. Do students really need beds? It's always curious to stumble upon one of those homes with a McCain sign on one end of the lawn and an Obama sign on the opposite. How do they ever get along? I found this house while riding on my early-morning bike-commute to Lee. It's almost humorous to envision the diametrically opposed husband and wife at the dinner table, fighting over mashed potatoes like it's a health care plan, while their only child asks questions about the election. That's certainly one way to confuse a kid. Ah Cleveland, choose wisely. Choose wisely. 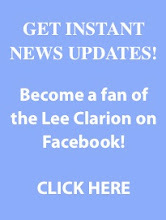 See the Republican and Democratic political columnists for the Lee Clarion on The Leede this week!